Sharonda Pickering and the Florida Gulf Coast University Eagles, upset rivals University of Central Florida Knights while handing them their first home loss of the season in Orlando, Florida, during a stunning five set victory in the first round of the NCAA Volleyball Tournament on November 29. It was the Eagles’ first appearance in the tournament in program history, earning the right after winning their first Atlantic Sun Conference Tournament title and their first ASUN regular season crown since 2012. Pickering, a middle blocker who was moved to outside right early in the season after a teammate’s injury, had five kills and four blocks in the Eagles’ 17-25, 25-22, 25-23, 14-25 and 15-7 triumph over the 16thseeded Knights. The victory, the Eagles first over a ranked opponent, also marked the first ASUN team since 2013 to win an NCAA Tournament game. Pickering told Island Sun Sports that they challenged the Eagles twice this season and lost both times. On Friday, the Eagles fell to the No. 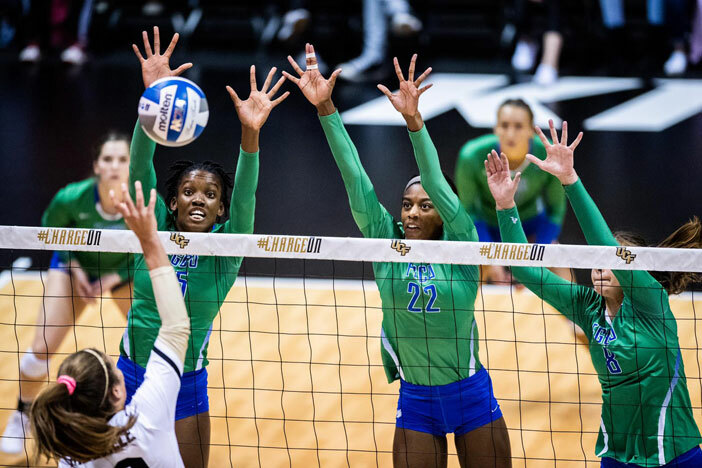 13 Florida Gators in straight sets, 25-17, 25-13 and 25-17, to end their record breaking season a 27-7, including a school record 16 games winning streak. Pickering finished with six kills and a block. She ended the season ranked No 3 in the NCAA in hitting with a .419 hitting percentage to break Carla Zeigler’s 2007 single season mark of .417. She finished just shy of Zeigler’s .403 career mark with .399. She ended her Eagles career at No 11 in block assists with 168 and No 7 in blocks per set with 1.05. Picketing is tied at No 6 in solo blocks in a game with four. She’s No 9 in blocks in three sets, with eight. The 6’2″ Pickering began her collegiate career with a trip to the National Jr. Colleges Athletics Association Volleyball Tournament as a Hillsborough Community College freshman, where her team won a bronze medal. She described it as an incredible feeling. Asked to reflect on her collegiate career, Pickering said she thinks about how hard it was for her starting off. Games were at a faster pace than she was accustomed to and by her senior year it had slowed a little and she has made many strides over the four years. Just after the start of her senior year, she moved from middle blocker to outside hitter and how different that was but she quickly adapted to that position and was able to help her team push to new heights, It was remarkable to basically start her career with the NJCAA Tournament and end it with the NCAA Tournament.